I have a massive scatterplot (~100,000 points) that I'm generating in matplotlib. Each point has a location in this x/y space, and I'd like to generate contours containing certain percentiles of the total number of points. Is there a function in matplotlib which will do this? I've looked into contour(), but I'd have to write my own function to work in this way. Make a kernel-density estimate (KDE) and contour the results. A KDE is essentially a smoothed histogram. Instead of a point falling into a particular bin, it adds a weight to surrounding bins (usually in the shape of a gaussian "bell curve"). Using a 2D histogram is simple and easy to understand, but fundementally gives "blocky" results. There are some wrinkles to doing the second one "correctly" (i.e. there's no one correct way). I won't go into the details here, but if you want to interpret the results statistically, you need to read up on it (particularly the bandwidth selection). One caveat: With very large numbers of points, scipy.stats.gaussian_kde will become very slow. It's fairly easy to speed it up by making an approximation--just take the 2D histogram and blur it with a guassian filter of the right radius and covariance. I can give an example if you'd like. One other caveat: If you're doing this in a non-cartesian coordinate system, none of these methods apply! Getting density estimates on a spherical shell is a bit more complicated. let give for every point in h2 2d matrix the cumulative number of points for rectangle which contain number of points equal or greater to that we analyze currently. Not the answer you're looking for? Browse other questions tagged python matplotlib contour scatter-plot or ask your own question. matplotlib contour plot geojson output? 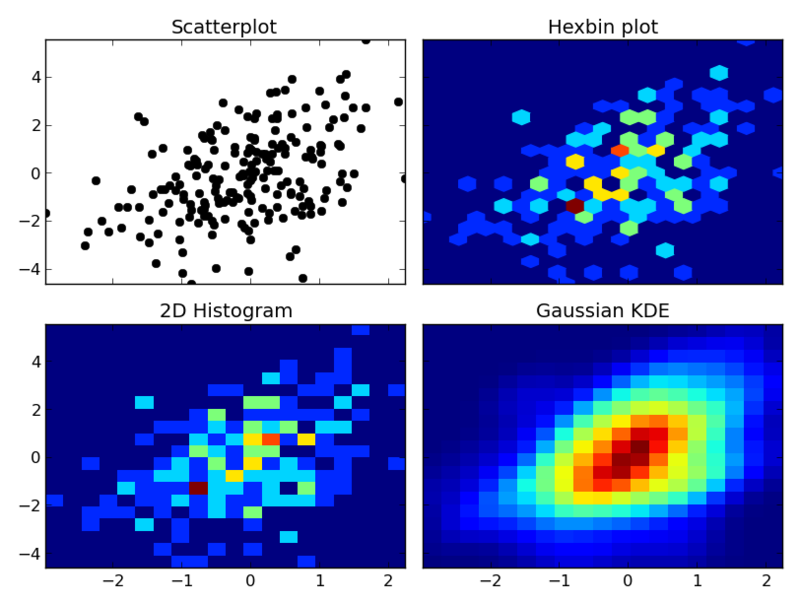 How to make Matplotlib scatterplots transparent as a group?